Mexican food. Enchiladas. Easy casserole. My husband and I are big fans of Mexican food so I tend to cook it often. Even if I only have rice, beans, and a jar of salsa handy, I can always whip up something quick that vaguely imitates Mexican food. It’s not fancy by any means, but it works for those days when we have a craving but I’m feeling lazy in the kitchen. 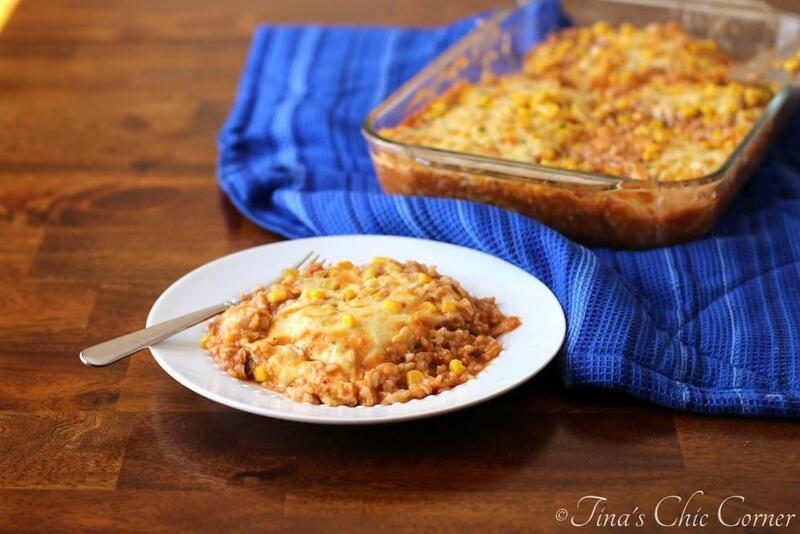 You know what’s great about this enchilada casserole? (Besides everything.) You don’t have to make the enchilada sauce and you don’t have to roll tortillas. Don’t get me wrong, there is a time and a place for that (and I’ve got recipes to prove it). 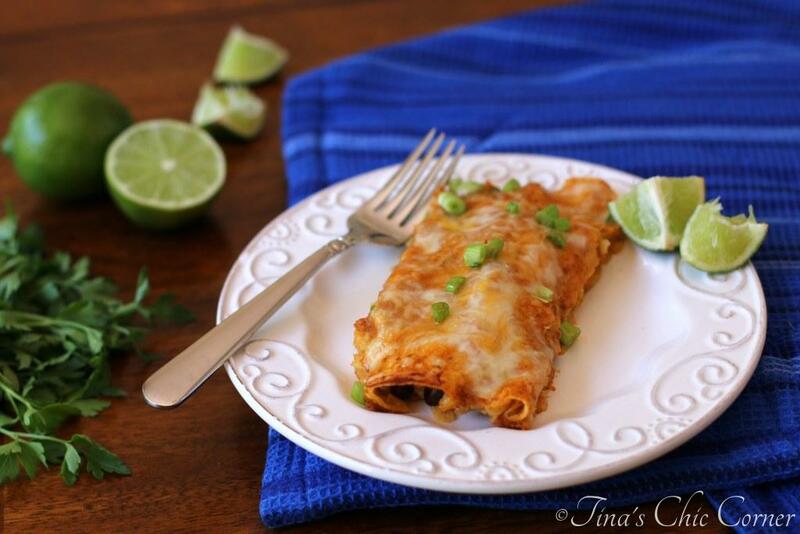 This meal is a perfect option for when you’re craving those delicious enchilada flavors and you want a quick recipe (you know, for those lazy days… we all have them). 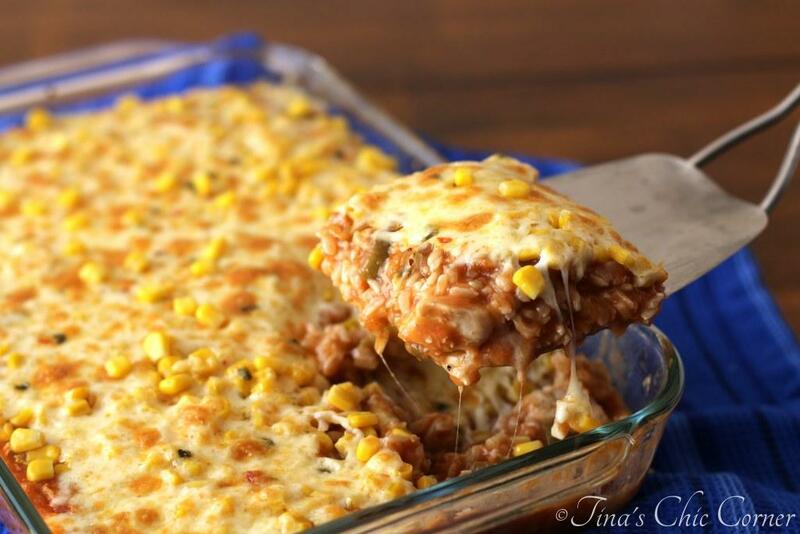 Have you ever had a dry casserole? I have and it’s not pretty. If you think about it, it kinda makes sense as to why that can happen easily and often. Many casserole recipes call for you to pre-cook the ingredients, place them into a baking dish, and then bake. Essentially this means that you are cooking everything (or almost everything) twice, which might result in dried out meats or a pasty center. This casserole is NOT dry. It’s loaded with enchilada sauce and refried beans which helps to keep the chicken and rice nice and moist. I suppose all that delicious cheese on top makes for a great barrier too. 😉 Also, it’s only in the oven for about 20 minutes and the less time it’s in there the less time it has for drying out. The corn is an awesome addition. Not only does it add a bit of texture, but it also tastes great with the flavors going on here. The chiles and Pepper Jack cheese add a hint of heat. Seriously, it’s not spicy, but it does add great flavor. However, if you literally want zero spice then feel free to omit the chiles and use another kind of cheese like cheddar or Monterey Jack. Cook the rice according to the directions on the package and then set it aside. In a large skillet, add the chicken and season with salt and pepper. Cook the chicken. Once the chicken is done cooking, remove the skillet from the heat and add in the enchilada sauce, refried beans, green chiles, and cooked rice. Mix all of the ingredients well. Sprinkle the corn on top of the mixture. 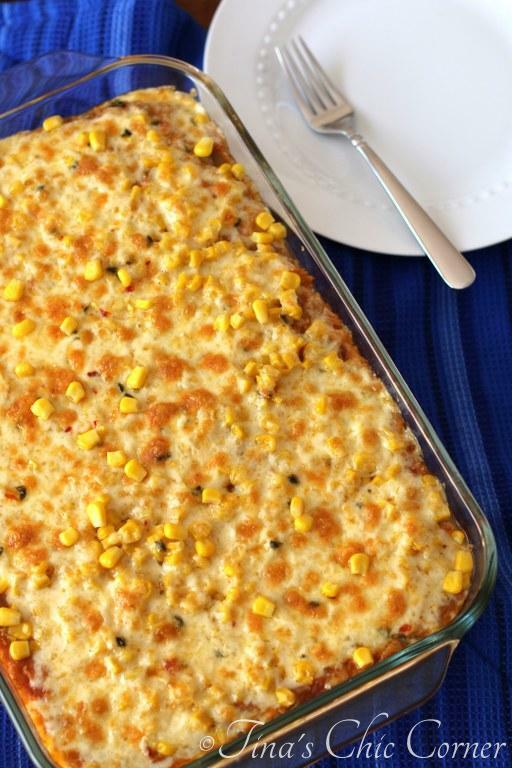 Sprinkle the shredded cheese on top of the corn. Bake it in the preheated oven for 20 to 30 minutes, or until the cheese has melted and the inside of the casserole is hot. 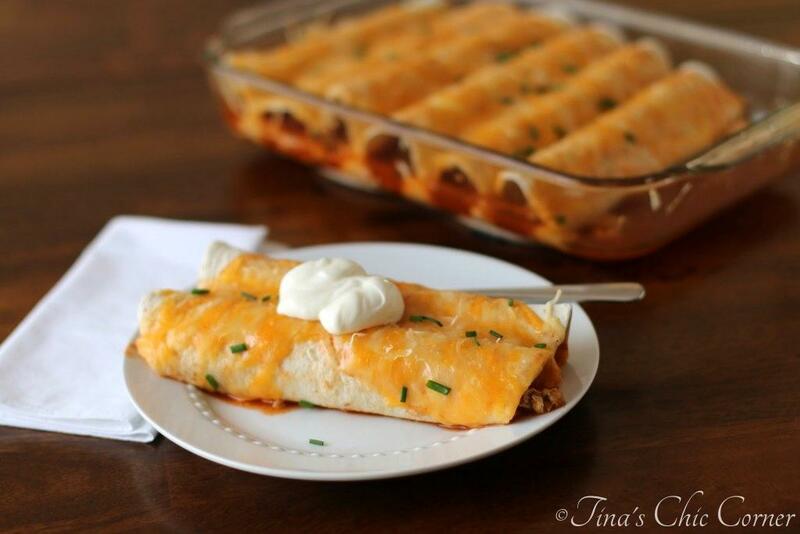 Here are some other excellent enchilada recipes. Love this! 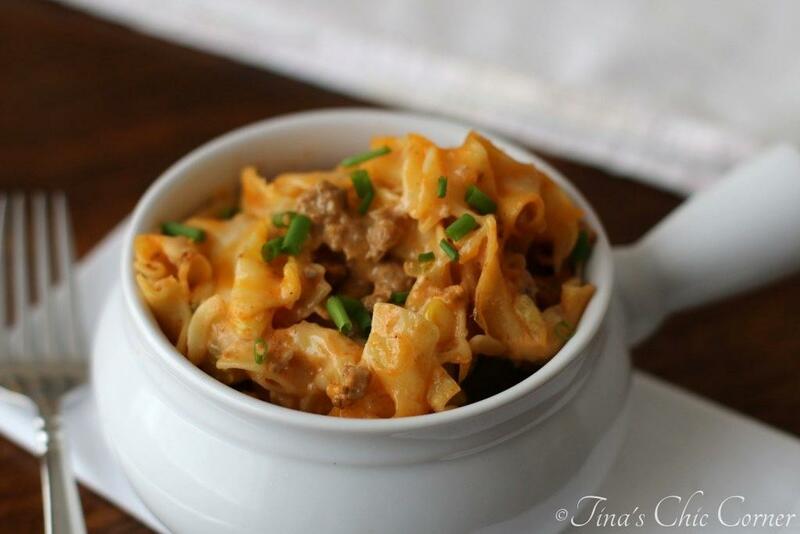 The perfect weeknight casserole, my boys would love it! Thanks so much Matt! Have a great weekend! Mmmm, I’m with you on the Mexican food subject & I may or may not have a cheeky jar of salsa on tap in the cupboard. But, you’ve gone & raised the bar with this one, it’d turn lazy days into comfort food. Big fan here….. BIG!! Oooh yum, Tina! Talk about a satisfying dinner and awesome work week lunches – love having a seriously tasty lunch to look forward to. These flavors are perfect! Not every leftover makes for a tasty meal, but this one really does and I’m loving that! Love those one pan dinners and that cheesy sauce. My teenagers would consume this entire 9 x 11 pan in minutes. I love anything Mexican…especially if I don’t have to roll tortillas (not that I mind…but it just means more time between making and eating)! This looks so delicious. I wish I could eat it right now. I know what you mean…I don’t mind cooking with tortillas but some days I can’t be bothered. Hehe. Thanks for stopping by! I would eat mexican every single day if I could! haha Loveeee the sound of this! Quick and easy – perfect for during the week. And look at that cheese… come to mama! Oh wow that looks good! You could feed an army with that! Nice pic’s too…. I’ve never made anything like this before, but it sounds wonderful. I love that it has so few ingredients. You’re right, perfect for a lazy weeknight! Oh yum, just look at all of that cheese! Pinning this for sure! Thank you so much! I appreciate you pinning. 🙂 Have a lovely weekend!